On February 28, 2010, Sunday, which was the eighth day of my stay in Rome from February 21 to March 5, 2010, I unexpectedly became an eyewitness of the Eucharistic miracle that occurred during the Sunday Mass celebrated by His Excellency Archbishop Giovanni Bulaitis, the Papal Nuncio to Korea from 1991 to 1997, and Fr. Aloysius Chang from Korea, in a chapel at the Archbishop's residence which is within the jurisdiction of the Holy See. These days when the opposition against Naju by the liberal priests in Korea is more fierce than ever and, for that reason, the official Church recognition of Naju is more urgently needed than ever before, Our Lord pulled out a surprise card by performing this great miracle to ring the bell announcing the beginning of the final stage of the work that He had started in Naju, Korea, twenty-five years ago in 1985. In His message to Julia Kim on October 19, 2001, He said: "I will finish the work that I started." The information about the true facts of Naju as well as the violent whirlwind of slanders and false rumors has even reached the people in Europe including many priests. The liberal priests in Korea, who have become quite widely known by now, organized the perfunctory Naju Investigation Committee of the Kwangju Archdiocese in December 1994, but have never carried out any worthy investigation of Naju based on the authentic doctrinal, theological, medical, and scientific standards. 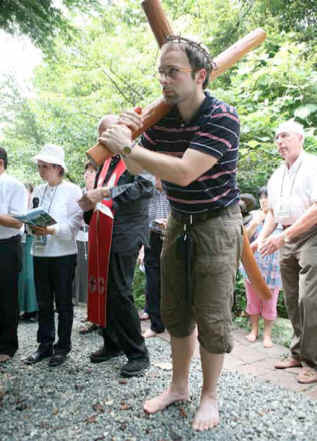 They have only been wielding iron hammers at the innocent faithful, who have received so much grace in Naju and are sincerely and humbly following the true Catholic Faith. They are still recklessly coercing the people to blindly obey the below-the-standard Declaration of the Kwangju Archdiocese. 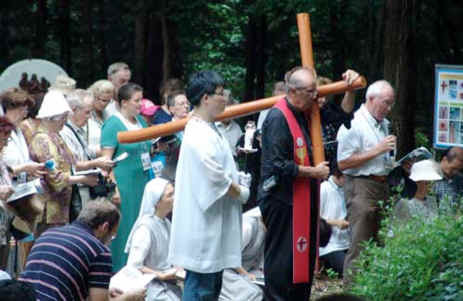 The priests and lay people in Germany who have learned about the real situation in Korea are perplexed by the crude and irresponsible behaviors of the priests there. They are not loudly screaming about this, but are quietly and frequently expressing their shock and disbelief at what the liberal priests in Korea have been saying and doing and deplore them. Whenever I notice this, I feel an indescribable shame (as a person who was born and grew up in Korea). 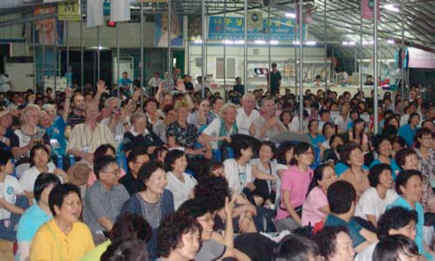 The Lord has been sending down so many messages and signs in Naju for the purpose of saving all the people in the world, but the opponents have been continuously despising and rejecting them and are now turning a deaf ear to the recent Eucharistic miracle that occurred in the Vatican as their last-ditch fight. It is so distressing to see their reckless and irrational opposition, which only reveals their defiance toward the Holy See and neglect and distortion of the authentic Catholic teachings. Do they really not realize that they are digging their own graves? After hearing about the Eucharistic miracle in the Vatican this time, the priests in Germany who had been negative on Naju, because they had been worrying about the possibility of disobedience to the Church authority, are now changing to a positive stance on Naju after realizing that it is actually the Kwangju priests who are being disobedient to the Holy See, distorting the Church teachings, and recklessly persecuting the innocent pilgrims. This was how I was able to accompany pilgrims to Naju in September 2010, who had been unwilling to visit Naju before. In addition, the publishers of several newsletters and newspapers in Europe also saw the DVD of the Eucharistic miracle and read the testimonies, and are expressing their strong amazement, admiration, and praise of the Lord's work. Many priests have called and encouraged me and ordered large quantities of the DVD. I am so happy to share the information about the Eucharistic miracle in the Vatican with more people and will continue to do so. These priests are keenly aware of the importance and greatness of the Eucharist miracle that occurred in the Vatican on February 28, 2010 and are saying, "Everyone should be informed about this miracle." I am not someone who has just heard about this miracle, but am an eyewitness. No one can stop me from giving my testimony. In the past, my efforts to spread the Naju information were sometimes obstructed by some priests who had read the Kwangju Archdiocese's Declaration, but, now, no one is interfering with my work to spread the information about this miracle. Oh, what an amazing and great gift the Lord has given to all of us through Julia! As I spread this information to many people not only in Germany but also in other countries in Europe, my heart is filled with joy and hope. I kept records of my experiences in Rome in the form of a diary. Now, I am making these records public hoping that they may give some consolation to those who are still being persecuted by the priests who refuse to believe what has been happening in Naju and also that these priests may open their eyes and ears which will give a greater glory to the Lord (Omnia ad majorem Dei Gloriam) Who is anxiously waiting for their return. I pray for abundant grace from the Lord and the Blessed Mother on everyone who reads this testimony. 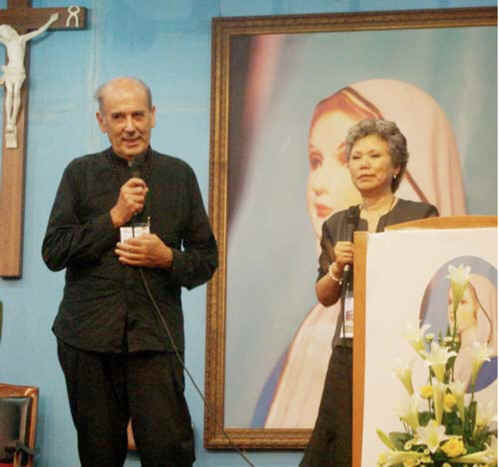 Julia heard an instruction from the Blessed Mother during the overnight prayer meeting in Naju on November 24, 2009: "Visit Archbishop Giovanni Bulaitis!" and planned to arrive in Rome on February 26, 2010. I left Germany for Rome early on February 21 to help Julia and also to visit a priest in the Vatican before Julia's arrival. It was about 9 a.m. at the Köln-Bonn Airport where I was waiting for the 10:15 a.m. plane to Rome. All the formalities before the departure were completed, and my husband went home. Because there still was some time, I went to the duty-free shop and selected a few items for the trip. When I opened my handbag to make the payment, the wallet and VISA card were missing. I felt as if the sky was falling down on me. Was I a victim of pickpocketing? But I had been tightly holding my handbag ever since my husband and I arrived at the airport. The salesclerk also was surprised and tried to calm me down by asking me to sit down and think about what might have happened. So, I sat down and began thinking. I vaguely remembered that, on the previous day, I was transferring the contents of my smaller handbag to a larger handbag and might have left the VISA card and wallet in the double-zippered compartment in the smaller handbag. With a trembling heart and a faint hope, I called home. My youngest son answered the phone and found both the credit card and wallet in my smaller handbag. "Oh, Lord and Blessed Mother, thank you!" I was so relieved and grateful. "Jesus and Blessed Mother, really thank you!" But there still was a problem. Without money and the credit card, how can I make this trip? I had some small money, but it was too little. I kept thinking and asked my husband to send my VISA card to the hotel in Rome. My husband answered with a firm voice: "What? Do you want the Mafia to take it away? It must never be done that way." He continued, "Call me ten minutes later." When I called home again, my husband said, "I talked to Fr. A in the Congregation for the Doctrine of the Faith. He can help you." He gave me further instructions. I finally restored the peace of mind and the willing spirit to continue the trip. It had been a long time since I had last taken a sightseeing walk in Rome. With a priest at the Congregation for the Doctrine of the Faith (a friend of my family) and Angelika, I visited several important places in Rome, which are usually missed by other visitors. From the walkway next to the Vatican, Via Gianicolo Passeggiata, we could see almost all of Rome. The most beautiful walkway was next to Castel Sant'Angelo. The view from there toward the Spanish Embassy was really spectacular. It was quite amusing to visit the smallest church in Rome, which was so small that one could not enter through the altar area and had only two or three chairs in it. I also became acquainted with several restaurants where prices were reasonable and wine was free. Rome is famous for delicious coffee. For the best-tasting coffee, one should drink it after 11 a.m., as the coffee machines function more efficiently several hours after they are turned on. In the morning, we visited Archbishop Giovanni Bulaitis, the Apostolic Nuncio to Korea from 1991 to 1997 and now retired after ten years' service as the Apostolic Nuncio to Albania until 2008. His residence was La Casa San Benedetto, located very close to the entrance of St. Peter's Square and was under the Vatican's jurisdiction. Archbishop Bulaitis welcomed us most kindly. In the living room, we all sat down and His Excellency told us the following. "While I was praying two days ago, the Blessed Mother said to me, 'Julia will relay some messages to you. On November 24, 1994 in Naju, you received the Eucharist that came down through Julia. This time, you give her the Eucharist.'" Then, the Archbishop asked Julia what her plan was. Julia answered, "I have no plan. I came to Rome to see Your Excellency at the Blessed Mother's request. I entrust everything to Your Excellency." The Archbishop said, "Let's celebrate the Sunday Mass tomorrow at the chapel in this building." We gladly accepted his invitation. 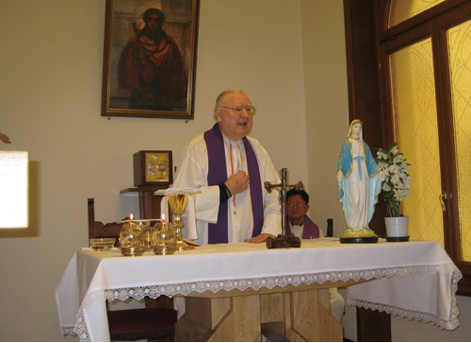 From 10 a.m., the Mass was concelebrated by Archbishop Bulaitis and Fr. Aloysius Chang from Korea in Italian and Korean. There were a total of twelve people at the Mass: the Archbishop, Fr. Chang, four Sisters who work in the building (Suore Albertine Serve dei Poveri), and six Koreans (five from Korea and me from Germany). Julia was sitting in a front pew on the right side, and I sat behind her. During the Holy Communion, Julia received the Eucharist in both species and I received Communion after her. I came back to my pew, closed my eyes, and quietly meditated and prayed for my union with the Lord and also thanked Him. Suddenly, it became noisy in the front of the chapel. When I opened my eyes, I saw Archbishop Bulaitis and a volunteer worker standing before Julia and intensely looking at something. I stood up and went to the front. Julia was keeping her mouth open. When I looked without knowing what was going on, I saw a lump of flesh instead of the white Eucharist on Julia's tongue. The white Eucharist that Julia received in her mouth just a few minutes ago changed into a lump of red flesh covered with many tiny blood vessels. Some parts of the Eucharist were still white, and scarlet-color blood was exuding from the Eucharist. As I was observing the Eucharist, which had been white a moment ago, changing into visible flesh and blood, I became totally shaken up and had difficulty controlling myself. I was really stunned. "What's going on before my eyes? How can such a mysterious phenomenon occur now? " An indescribable shudder penetrated deeply into my whole body. I immediately knelt on the floor and offered the worship of Latria to Our Lord Jesus Christ Who is truly present in the Holy Eucharist. Then, with an immense feeling of awe and shock that totally conquered me before this unexpected, astonishing, and mysterious miracle, I burst into tears and cried. I prostrated very low on the floor as a very little person before the Lord. Others in the chapel also cried. "Oh, our beloved Savior, my love, Jesus Christ! Why? For what purpose? What does this mean? Do You love me, a sinner, so much as to allow me to witness this sign of stupendous importance and significance? So, are You making me a living witness, sitting right behind the victim soul? Why? For what reason? But You allowed me to witness this with my own eyes. . . "
"Now You came to me without leaving even the shortest distance between You and me. From now on, how should I plan my life day after day to conform to Your Will? What road should I choose in order to please Your Heart at every moment of my life?" The time was about 10:50 a.m. on February 28, 2010. I later learned that the Blessed Mother told Julia that the miracle this time was the thirty-third and last Eucharistic miracle for Naju. It was also the 13th Eucharistic miracle that occurred on Julia's tongue. I returned to my pew, still trembling with intense emotion and weeping, and was about to do some meditation on the Lord's Real Presence in the Eucharist, but someone screamed loudly and I went to Julia again to see what was happening. I saw on Julia's tongue the Eucharist in the form of flesh and blood swelling to a thickness of 5-7 cm like a dough mixed with yeast and in the shape of a heart. The Eucharist also continued moving like a living organ. I could still see some white spots on the Eucharist. Scarlet-color blood continued flowing from the rear top of the Eucharist. I had heard about the Eucharistic miracles before and seen them in photographs and DVDs, but never imagined that I was going to be an eyewitness of such an amazing and great Eucharistic miracle. That was why I was so shocked and was feeling an enormous emotion. From the deepest bottom of my heart, I thought, "This Eucharistic miracle tells us how great the Lord's love for human beings is. . . "
It is impossible to describe with words how I was feeling at the time of this Eucharistic miracle. I was totally overwhelmed by the great love of the Lord for me, a weak and little soul, and became one with my Lord, Jesus Christ, my Love. My heart was filled with endless gratitude to the Lord. "My Lord, Jesus Christ, I love You enormously, endlessly. I love everything about You forever and ever." I returned to my pew again and began meditation on my knees. It was so quiet in the chapel that I could hear others' breathing sounds, as everyone was in deep prayer and meditation. A while later, Archbishop Bulaitis instructed Julia to drink a little water first and then swallow the Eucharist that had changed into flesh and blood and become larger. Julia did exactly as she was told. Then, the Archbishop gave a blessing to all who were present, which signaled the end of the Mass, during which a Eucharistic miracle occurred. Then, the Archbishop cleaned the inside of Julia's mouth with a cotton purificator to make sure that the blood was not from any wound in Julia's mouth. There was no wound in Julia's mouth and the purificator was clean. After cleaning the inside of Julia's mouth, the Archbishop unfolded the purificator and showed it to everyone in the chapel. After the Mass, the Sisters served coffee and cake and the Archbishop commented on the Eucharistic miracle that had just occurred. He could not hide his overflowing joy. To the Sisters, he said repeatedly, "What a great honor for this house!" Then, Julia and the volunteer helpers walked to St. Peter's Square to participate in the Holy Father's Angelus at noon. Such a walk is not always possible for Julia, as she frequently suffers intense pains in reparation for the sins in the world. After the Angelus prayer, the Holy Father gave a blessing to all the pilgrims from different countries in the world. At that moment, Julia made a deep bow by prostrating on the ground as a sign of profound respect for the Pope, the Vicar of Jesus on earth. She did not pay attention to the eyes of the crowd in the Square. Julia later told us that she heard the Holy Father calling her, "Julia Yoon!" as she was making the bow. At about 8:45 a.m., Fr. Aloysius Chang, three volunteer workers, and I finished breakfast and went to Julia's room. We knocked at the door, but there was no response. After several tries, Peter Kim forced the door open. Julia was lying on the floor right behind the door and was unconscious. Near her head, there was a fruit knife that we had been using. A while later, Julia regained consciousness and explained: "A vast swarm of devils came toward me, and the head devil said, 'We must kill this wretched woman, who is an obstacle to our work, before she can see the Archbishop. Kill her without making any noise and fast'. Immediately, the devils began attacking me, ruthlessly throwing me away and beating me. The head devil said, 'Cut this wretched woman's carotid arteries with this knife to make it look like a suicide.' As a devil picked up the knife and was about to stab me in the neck, the Blessed Mother promptly came and struck the knife away. The devils immediately ran away." Before the devils' attack began, Julia had been sitting in a chair before the computer. She said, "I cannot understand how I became unconscious and fell near the door that was 3 meters away from where I was and also how a fruit knife was lying close to my head." It was so shocking. Before we went to Archbishop Bulaitis' residence, those around me in the hotel smelled sweet fragrance from me and said to me, "Congratulations!" I could not understand it. How was it possible that they could smell fragrance from me? Anyhow, I was happy as if I was standing near the entrance gate of Heaven. We arrived at the Archbishop's residence at about 10:40 a.m. While the Archbishop was commenting on the Eucharistic miracle and the devils' attack, Julia suddenly began suffering the pains of the Crown of Thorns before us. It was 11:04 a.m. The scarlet-color blood was flowing down from the right side of Julia's scalp. The Archbishop called the Sisters, and they rushed in to witness the mysterious phenomenon. The blood continued to flow down, from the left side and the center of the scalp as well. When we looked more closely at her scalp, we saw many wounds from the Crown of Thorns and blood flowing from them. In the middle of Julia's scalp, there were seven round wounds forming the shape of a heart. Blood began flowing from them. The Sisters were looking at this and filled with amazement and shock. They kept asking me questions, and I tried to answer them in my insufficient Italian. The lunchtime was approaching. The Archbishop invited us to lunch, but we said, "Your Excellency, this time, please let us invite Your Excellency." However, the Archbishop was firm. We all went to the Archbishop's favorite Italian restaurant. When we sat down, the Archbishop said to me, "Order the wine that you like best." So, I ordered my favorite red wine. When the waiter brought the wine, the Archbishop poured it into our glasses. When all our glasses were filled, Julia made a small cross on each glass and prayed quietly. Then, to everyone's amazement, a strong fragrance of roses spread from the wine in the glasses. We were amazed, but the employees of the restaurant were even more surprised. The restaurant's manager was in panic thinking that the wine was bad and tried to bring another bottle. We were all amused and laughed. I think that this very pleasant time in the restaurant was also arranged by the Lord and the Blessed Mother and that the Lord and the Blessed Mother were with us. Because of the possibility of the devils' attack at any time, we could not leave Julia alone. I had planned a city tour for the benefit of those from Korea, because their chance of visiting Rome again seemed slim, but I had to cancel this plan because of Julia's almost constant suffering. So, instead, I went out for a walk with two of the volunteer workers - Peter Kim and Peter Suh. We walked on the walkway: Via Gianicolo Passeggiata, which I mentioned earlier. The two Peters uttered admiring cries repeatedly while looking down at the panoramic view of Rome. 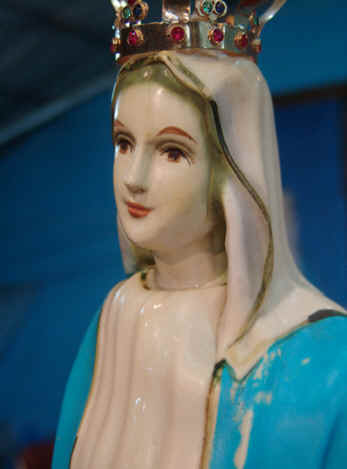 In the evening, Julia gave me a few pieces of linen that had absorbed the fragrant oil exuded from the Blessed Mother's miraculous statue in Naju in 1992. The sweet fragrance from them was very strong. As I was inhaling the fragrance, I felt that this fragrance was from Heaven. The strong heavenly fragrance was all around me. Even after I put the pieces of linen in a drawer, the whole room continued to be filled with the fragrance. I could also smell the fragrance from my hands, with which I touched the linen. After the special experiences during the past several days, I was still in the middle of deep excitement. Especially, I continued to be overwhelmed by the experience of the Eucharistic miracle. Also, the sweet fragrance from the pieces of linen that I received yesterday was still with me. At about 8:47 a.m., Julia was attacked again by the devils while writing down the messages that she received from the Lord and the Blessed Mother. After the attack, she had a wound under her left eye, caused by a sharp object. Her cheeks were swollen. There also was a bruise on her left leg. On the keyboards of the computer, there was a line of black smudge. The chairs were turned over on the floor. Oh, how can such things occur in our age when the civilization is so developed even to the extent that parents can select from their DNAs to "make" babies according to their preference? The scientists have published papers claiming that they have figured out the mysteries of Mars. Many people in our age cry out, "God is now obsolete!" and are building a new Tower of Babel by asserting that they can find a scientific answer to all the phenomena in the world and beyond, even including the mysterious phenomena. They have fallen into extreme pride and are running around not knowing how high the sky really is. It was many years ago that they forgot about the existence of the devils. Even many of the Catholic priests practically do not believe their existence. How many people will become aware of what recently occurred in Rome and how many of them will accept them as true and enormously important facts? Julia said, "Satan certainly does not want people to know about the Eucharistic miracles, my sufferings, the devils' attacks, and especially the propagation of the messages. Satan will mobilize all the available means to block it." I firmly believe in all the miracles that occurred recently in Rome and also that these miracles will play a decisive role for the Triumph of the Blessed Mother's Immaculate Heart. Meanwhile, I took some free time and went out of the hotel. I took care of some personal business in a store on Via Borgo Pio and, then, was drawn to the front gate of the Papal Palace, as, at that moment, I strongly wanted to be closest to the Holy Father. Standing before the gate, over the shoulders of the Swiss guards, I thought about the Holy Father and felt a deep pain in the bottom of my heart. "Oh, Your Holiness, whom I love so much! Is Your Holiness aware of the great Eucharistic miracle that occurred at such a short distance from where Your Holiness is?" Looking back, I had wished that this Eucharistic miracle could have occurred at the Mass celebrated by Your Holiness himself. I could not control my tears. At about 1:40 p.m., when I was focusing my attention on translating Archbishop Bulaitis' testimony, Angela in Julia's room (next to my room) suddenly screamed. I left everything that I had been doing and rushed to Julia's room. Julia was attacked again by the devils when she was walking out of the bathroom. She was lying down unconscious on the floor. "Oh, my goodness! What happened this time?" At about 1:50 p.m., I saw Julia's blouse badly torn. When we looked more closely at her blouse, it was torn violently with something as sharp as a shaving blade. We were amazed to see that the tears on the right side of the blouse exactly matched those on the left side. When we examined Julia's shoulders, we saw the marks caused by a devil's biting on her right shoulder. Then, less than five minutes after Julia changed into a clean blouse, Julia suddenly said she was feeling pain on her neck. When we slightly lifted the collar of her blouse, we saw six new wounds about 6 cm long on the right side of Julia's neck, as if it was caused with sharp shaving blades. These wounds were not there a moment ago. The devil must have forcefully scratched the back of Julia's neck twice with his hands that resembled a rake. From the wounds on Julia's neck, blood suddenly leaked out like large water drops. We wiped the blood hoping that the bleeding will stop, but blood kept flowing out. Now, we learned that the devils have hands that are not like ours but are like a rake with sharp blades. This also means that the devil is slowly and foolishly unmasking his real identity. Isn't this another reason for our shouting for joy? Julia offered up all these pains, like a heroine, for the Holy Father, Cardinal Ivan Dias, Cardinal Wiliam Levada, and Archbishop Bulaitis. Not to be late for the Holy Father's public audience today, I got up at 6:30 a.m. and went downstairs to the dining room at 7:30 a.m. The girl who worked in the dining room greeted me cheerfully: "Signora, you came down early today." I said, "Ah! I have an important schedule in the vicinity today." After the breakfast, we went to Archbishop Bulaitis' residence again, and, together with a Sister as our guide, went to the audience building (Aula). As we were entering the building, the Swiss guards saluted us. I was pushing Julia's wheelchair. As the Archbishop had instructed us, we took seats in the front. Especially today, a famous orchestra in Rome was playing on the right side of the stage. The Sister said to us, "You are very lucky today." I was briefly speaking to one of the Swiss guards, and he said that there were about 8,000 pilgrims in the audience building. A while later, the Holy Father came in and sat in a chair not far from us. Julia was suffering extreme pains, especially in her brain. Even a little movement of the wheelchair made her suffer more pains. We waited patiently hoping for a chance to speak with the Holy Father even briefly. It was more than ten years ago. . . in October 1998, when I met the Holy Father concerning Naju. At that time, he was Cardinal Ratzinger, Prefect of the Congregation for the Doctrine of the Faith. He intently listened to my report on Naju and encouraged me to write to him. I have since been writing to him from time to time. But will he recognize me today? While waiting, I thought, "In a moment, the Holy Father will come closer to us." As if he noticed our anxiousness, the Holy Father's head protocol secretary came to us and said, "Have a little more patience. The Holy Father will come to you in five minutes," and walked away. The five minutes seemed very long to us. Then, to our disappointment, the Holy Father waved his hands and did not come to us. Maybe he was feeling tired. We were enormously disappointed at that moment. "I had some words to convey to the Holy Father without fail . . . But we can wait for the next opportunity . . . Surely, the Blessed Mother must have a different plan. . . "
As the audience was about to end, we prayed "Our Father" in Latin with the Holy Father. We also sang "Salve Regina" in Latin together, feeling enormously moved and joyful. The reason for our joy was that we were all one same people as Catholics regardless of our racial origins, nationalities, languages, appearances, and colors of the skin. We were singing to praise the Lord together with one heart and in Latin, the language of the Holy Catholic Church. Our joy and emotion were indescribable. Since the Second Vatican Council, Latin, which is the language of the Church, has been treated like a stepchild. "Your Holiness, Pope Benedict! Thank you so much for uniting us like this with the language of the Holy Catholic Church. We love Your Holiness all the more because of this." Julia had an appointment to see His Eminence Cardinal Ivan Dias at 5 p.m. For the success of this meeting, we offered a Mass celebrated by Fr. Aloysius Chang in the hotel room from 3:30 p.m. At about 4 p.m., when Julia received the Holy Communion, she began suffering the pains of the Crown of Thorns again. I felt a shudder, as I saw fresh blood dripping down from Julia's head. I meditated on the Lord, Who suffers pains because of our sins, especially, the sins of pride. I was so grateful to the Lord for being able to do this meditation. At that moment, Julia received a message from the Blessed Mother. At about 4:15 p.m., Archbishop Bulaitis and a Korean Sister as the interpreter came to the hotel in the car sent by Cardinal Dias to pick up Julia. The rest of us gathered in Julia's room at the hotel and prayed the whole decades of the rosary starting from the Joyful Mysteries with one heart. After the prayer, we all went outside of the hotel's gate and waited for Julia's return. I thought, "The later Julia comes back, the better the results must be. As Julia's return is getting late, this is a very good sign." Julia returned at about 8 p.m. She said that the meeting with the Cardinal went very well and told us about the details of the visit. I paid a special attention to what Cardinal Dias said according to Julia's report: "The Archbishop of Kwangju has no valid ground for excommunicating the pilgrims to Naju. He does not have the authority to do so." Cardinal Ivan Dias is the highest pastoral authority (under the Holy Father) over the Catholic Church in Korea, as the Cardinal is the Prefect of the Congregation for the Evangelization of Peoples and Korea is still officially "a mission territory". Those who have ears to hear will appreciate the importance of the above words by Cardinal Dias. In the morning of March 4, Thursday, Julia washed herself in the hotel bathroom and dried herself with a white towel provided by the hotel. Mysteriously, there were bloodstains on the towel, even though Julia did not have any wounds. I am sure that such signs appear, because Julia participates in the sufferings of the Lord and the Blessed Mother. I also think that the Lord and the Blessed Mother give these signs to Julia as signs of love in appreciation of Julia's giving all of the glory to the Lord, consoling the Lord and the Blessed Mother, and participating in the sufferings for the conversion of sinners without expecting any reward. Anyhow, during the week I spent with Julia in Rome, I personally experienced amazing mysterious things every day that I had never experienced before in my life. Thank you, Lord and Blessed Mother! In the afternoon, Julia's suffering eased somewhat and, for the first time, we all visited St. Peter's Basilica together. Julia especially wanted to pray at John Paul II's tomb in the Basilica. We first visited the tombs of several other Popes in the Basilica, but there was a thick rope at the entrance to John Paul II's tomb to control the visitors. After receiving a special permission from the guard, Julia alone entered that area, kissed John Paul II's tomb, and quietly prayed for a long time. Then, we visited a side chapel in the Basilica where the Eucharist was exposed. We prayed briefly on our knees before the Eucharist. As we were running out of time, I only explained the highlights of the inside of the Basilica to my companions. As it was the day before leaving Rome, we ate dinner together and briefly conversed about what had happened during the previous several days. At about 8:12 p.m., I went to Julia's room to say Good-Bye, as, the next morning, a taxi would come to take me to Fiumicino Airport. Julia embraced me, prayed to Jesus for my health, and kissed me where I was not feeling well. I came out of Julia's room and entered the elevator to go to the reception area downstairs. When I spontaneously looked at myself in the mirror in the elevator, I noticed some water drops on my left shoulder. I wondered what they were. When I touched the water drops with my hand, it was a little sticky, and I smelled a strong sweet fragrance completely filling the area around me. "Oh, my goodness! Isn't this the fragrant oil? But where did it come from?" The sweet fragrance continued. Of course, such phenomenon has occurred quite frequently in Naju. "But this is a hotel in Rome. How is it possible?" I said to myself again, "Imagination and hallucination are not allowed," and went back to Julia to hear her opinion. When Julia saw me, she said, "This is fragrant oil. The Blessed Mother gave it to you." I was so touched. Actually, when I first entered the elevator, I did smell the fragrance, but thought that it was because Julia kissed me. "Oh, Jesus, Blessed Mother, thank you very, very much. I am overwhelmingly grateful. Ah! My beloved Heavenly Mother sent down to me such sweet and beautiful fragrant oil! The oil that signifies Mommy's love, friendship, and presence (Quoted from the Blessed Mother's message to Julia on April 8, 1993). Mommy! Thank you so much. You knew the sorrows and pains in my heart and took such a good care of me to console this sinner." "Oh, my beloved Jesus and Blessed Mother! I am truly, truly grateful. I have never imagined that such things would happen to me. . . Thank you and thank you again for the unexpected grace and sign of love and friendship. My beloved Jesus, My Lord, the Lamb of God, and my beloved Mommy, Virgin Mary, I love Thee with my whole heart. You are mine forever. Amen." At 10:00 a.m., the taxi came to take me to the airport. Julia came out despite her suffering together with the volunteer helpers and waved hands until they could not see the taxi any longer. I am also so grateful to the volunteer helpers who gladly loaded my suitcases into the taxi. When I come home from a pilgrimage trip to Korea, I recover from the fatigue and readjust myself to the German time without much difficulty, despite the fact that there is a seven-hour difference between Germany and Korea and also I work hard to take care of other pilgrims. This time, however, I suffered from fatigue for almost two weeks after the trip to Rome. I slept a lot, too. There is no time difference between Germany and Italy. I always think of Italy as a neighboring country. The unusual fatigue this time probably was because of the extraordinary experiences in Rome. I must have exhausted my energy by focusing all my energy and nerves on the stupendous events that happened in Rome. 9. Six months later. . .
On August 30, 2010, the airplane carrying us - 22 lay pilgrims from Germany and one priest from Austria - landed in the Incheon International Airport near Seoul in Korea. Then, we flew to Kwangju, the provincial capital near Naju and spent four days in Naju from September 2 to 5, 2010, especially to participate in the overnight prayer meeting in Naju on September 4, a First Saturday. 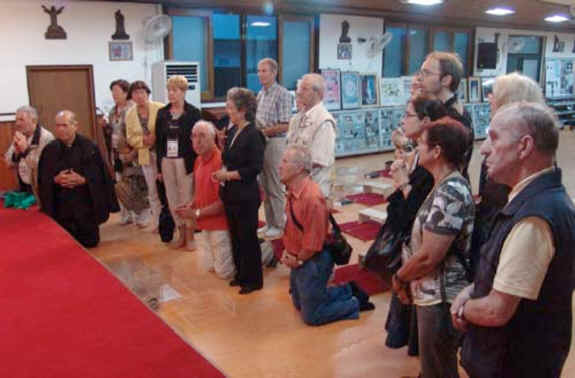 The pilgrims were strongly moved by their experiences in Naju. One lady was healed of her advanced diabetes. Fr. Johannes Enichlmayr, a pastor in Austria, was so impressed by what he saw in Naju that, after his return to Austria, he sent the information papers on Naju to thousands of Catholic parishes all over Austria. He is also leading prayer meetings in a home that belongs to a lay family to pray together and discuss how they can put into practice the Blessed Mother's requests in her messages through Julia Kim. I pray for abundant blessings and grace from the Lord and the Blessed Mother upon everyone who reads this testimony.